I discussed this update yesterday, and I’ve decided to release it before the weekend. Oh! And for those who didn’t check out betas, this will be your first chance to see the background auto-updater in action. I think you’ll find it much more convenient than the in-your-face update process that older versions required you to sit through. That edge of words are not smooth. * The “Info” window does not show up version 3.5.x. * The default unit for the fixed size (marking something) should be “px” instead of “cm” or “inches” I guess. * I’m using the German translation and the label “Deckfähigkeit” (opacity) of the layer option window is too small. * Again something about the German translation: I think “Primärfarbe” is better than “Primärfarben” (same for “Sekundärfarben”). * And agan German: In all cases a slash should have a space before and after itself. At least in the string “Farbton/Sättigung…” it’s missing. Lars, “Info” window? Never heard of it. Wow… I just installed this update and boy, this thing flies even on Windows XP on an MSI Wind U100 Netbook (Atom processor). Very impressive. Keep up the great work. Rick: It’s “About” in English. Works here for me, though in 3.5.1; both in the English and the German version. Thanks Rick, it is so beautiful on Windows 7. I have noticed that menus are laging when submenu is open (http://www.picamatic.com/show/2009/11/21/03/59/6020660_202x202.png). Great, another update for my favorite photo editing program.. Though one thing I really finds annoying is that when you create some text, you cant edit it, or move it around or anything after you have deselected it..
– It should be like in photoshop for instance, where it creates a new layer every time you create a new text.. And then you should be able to select it again, and edit the text..
Another, though more advanced thing, is that you aren’t able to select more than one layer at a time! That should be a possibility.. Thanks for a great program, keep up the good work..
Jeppe Richardt raises an interesting point, how hard would it be to implement the ability to perform selections as well as adjustments or effects on more than one layer at a time? It it on the long-term roadmap? The check for updates option has been moved to the utilities menu. 3. While still holding down the LMB try selecting under a floating palette. This works. 4. Still holding down the LMB, hold down the RMB too. This will enable you to move the selection done so far. After releasing the RMB you can continue selecting (while still holding down the LMB). 5. While still holding down the LMB try selecting under a floating palette. This no longer works but instead turns the palette opaque and stops selecting at its edge. Above procedure also works with LMB and RMB swapped. How come I can’t install v. 3.5 and 3.5.1? Every time I try I get this message: “A processor (CPU) with SSE support is required.” So far I’d no problems running v.3.36. svend, Because a processor with SSE support is now required. Sounds like you have a very old computer. 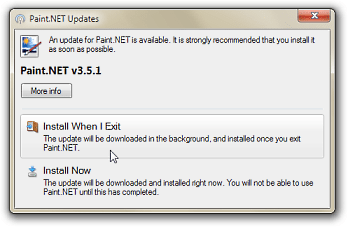 You’ll simply have to upgrade if you want to install any newer version of Paint.NET. There are some translation errors. I’ve noticed a license change, and as comments are now closed in the post about it, I’ll post it here: Does the change mean that you intend to make Paint.net commercial in near future? Asking out of curiosity :-). Pawal, I closed that post for commenting for a reason: I’m done hearing about it, and don’t want any more comments about it. I never said anything about making Paint.NET commercial in the future. Chris, this isn’t a troubleshooting forum. For that, you need to go to the forum (accessible via the Help menu). Everytime I open paint.net the program window is shown very fast (not like in 2.x) but the cursor stays line tool for some seconds wherever I move it, also on the toolbars. I can’t click anywhere while these few seconds. If I give an image as an parameter this cursor problem takes nearly 20 seconds! My second problem: My taskbar gets invisible when I move the cursor out of it (I configured it like this). But while Paint.Net is loading more than one image given as parameter, the taskbar doesn’t dissapear, it appears and dissappears many times. Maybe Paint.Net want to get the input focus after loading any image, but it’s task button doesn’t get yellow while doing this. A good program anyway but I hope this could be fixed in the next release. everytime I open paint.net is showed a message saying that I don’t have the .net 3.5 sp1 installed, but I have!